Deployed in a Docker container? None of these are good definitions. "A single programmer can design, implement, deploy, and maintain." "Software that fits in your head." "A microservice implements a single bounded context." "A single logical database per service." "Built & deployed independently. Stateless; state as backing services." "Addressable through a service discovery system." This is another architecture — which is incredibly interesting! But not what we'll be talking about today. No more shared DB — distributed transactions?! Monitoring and instrumentation — tailing logs? Nagios and New Relic? ha! 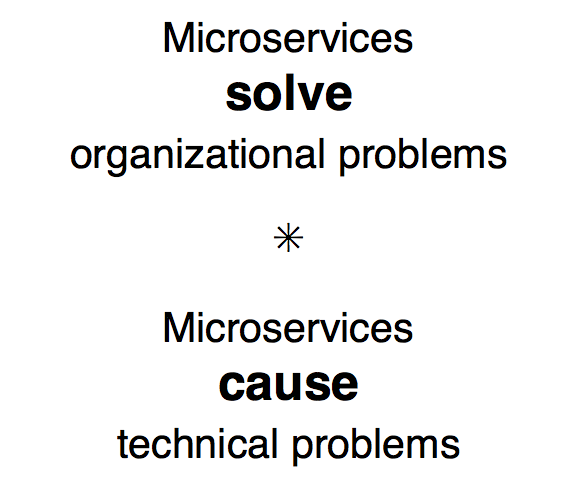 Why not the best language for microservices? Reasonably generic interfaces for service discovery, event streams, etc. 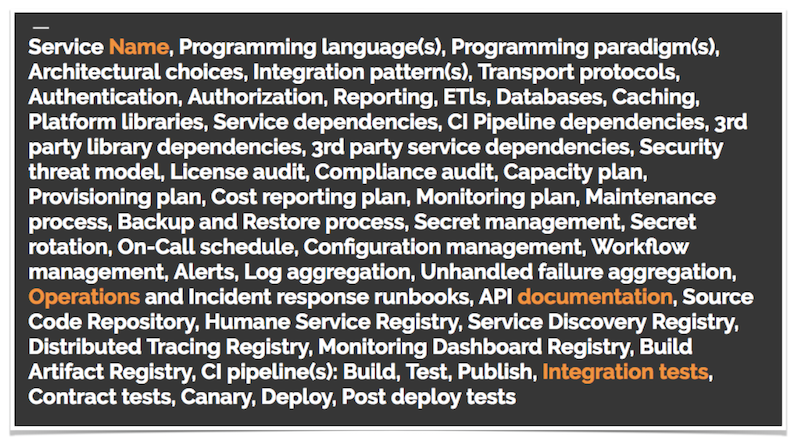 Enforce organization standards for logging, instrumentation, etc. In general, a way to create & maintain a shared context for building Go microservices, interoperable with other teams' work. Let's say we have some service, illustrated by an interface. Without Go kit stuff, for now. Defining a ServeHTTP method on the profileService turns it into an HTTP handler. Now that the profileService is an HTTP handler, we can pass it to ListenAndServe. Our business logic is still clean, but now our transport code is full of mixed concerns. 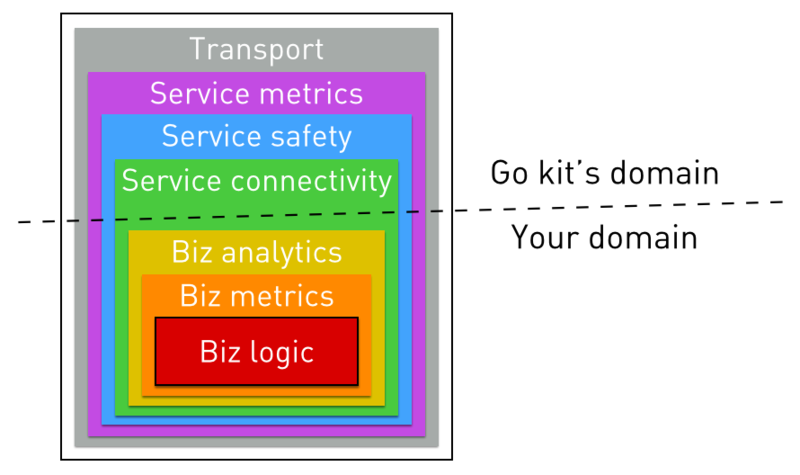 Go kit encourages you to separate all of these concerns. It would be great to have some kind of single-purpose, composable middleware. Let's generalize each operation as an RPC: request, response. We can model RPC methods as endpoints. RPCs can fail, so we want some way to signal failure. And we'd like to have some way of passing request-scoped information between the layers of this onion. So the actual definition is a little bigger. One way to do it is to change the profileService methods into endpoints. Another way is to write endpoint constructors which take the (unaltered) service. This way is better. It allows us to leave our ProfileService interface pure, avoiding mixing in the endpoint concerns. In either case, now that we have a general form for our operations, we can layer in value-added stuff without knowing or caring about the underlying logic. Perhaps the simplest middleware is one that just logs the call. Add another layer of context. And here's how you wire it in. Each middleware is exclusively concerned with one task. You can avoid mixing different concerns in the same place — keeping each piece of functionality pure and distinct. This makes your code much easier to maintain, refactor, and eventually delete. So far our middleware has operated on an endpoint. But remember we also have a service interface. Which means we could define a service middleware, custom to our application. 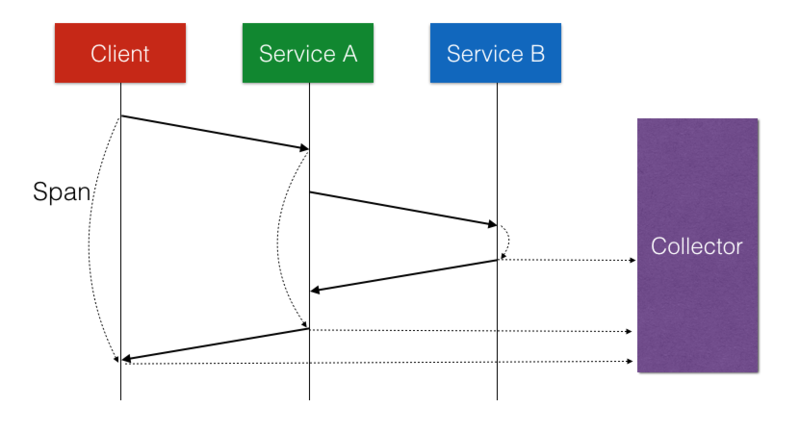 Service middlewares are a good way to implement single-responsibility functionality that interacts with your business domain. Let's say you wanted to know when any Michaels registered. And wire it in to the service declaration, similar to constructing endpoints. Go kit comes with a handy HTTP transport. It adapts an endpoint to an HTTP handler. Use it with the slightly more fully-featured Gorilla muxer. Can easily have the same service served on multiple transports simultaneously. Shared middleware stacks, just different serialization. Your organization has probably already decided on a transport layer. And you've probably already built tooling, reporting, and culture around it. 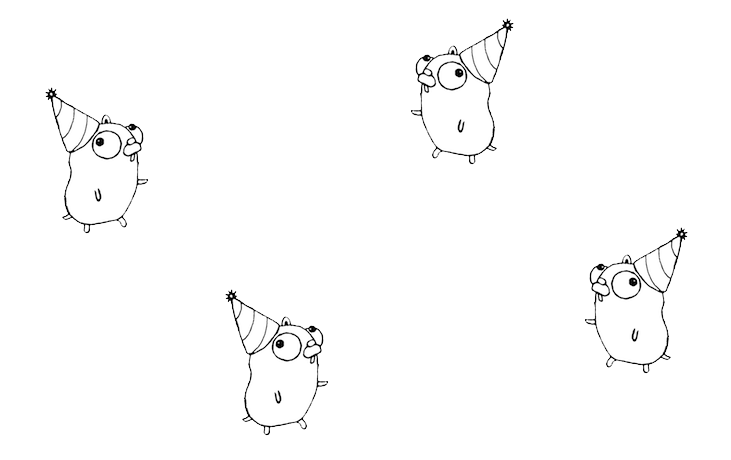 Go kit wants to make it easy to adopt Go. We will always play nicely with your infrastructure, to the extent it's possible. You know best. Whenever control passes in to or out of a microservice, that service notes timing, annotation, and contextual data into a partial span. Spans are batched and emitted to a collector. The collector stitches together multiple related spans into a trace. One popular implementation is Zipkin. It produces a sequence diagram of all the requests between your microservices. Go kit has a helper to move IDs from e.g. HTTP headers to the context object. And then middlewares to create the spans and emit them to the collectors. Now, if you want to support Zipkin, you just add a middleware to your stack. Imagine trying to do this without some structure? Make microservices tractable, and make Go viable, for your organization.